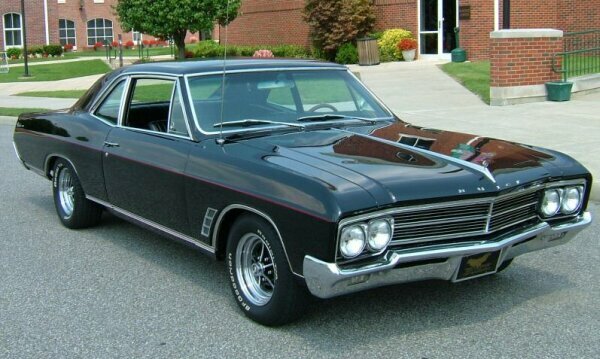 By the time the 1966 model year arrived, the midsize body carried the Gran Sport emblem as a model, rather than an option, to the Skylark, propelling Buick even closer to the muscle car status it has since become known for. Potential buyers were greeted with a fresh look brought about by the design success of the Riviera, less--and certainly more sporty looking--trim, and although the power remained from the previous year, two other engine choices were available to wet the appetite for those with a heavier right foot. Unfortunately for Buick, 1966 proved to be a somewhat sluggish year in sales, dropping the automaker to sixth in line in the final year-end tally. As a result, Gran Sport sales also took a slight dive, totaling 13,816 units, the bulk of which belonged to the hardtop coupe with 9,934 units as it had the previous year. Total coupe production finished the year out with 1,835, and convertibles totaled 2,047 units.